On Saturday night in Los Angeles the heavyweight championship was on the line when Deontay Wider and Tyson Fury squared off to see who the dominant big man in the business was. The man put in charge to make sure The Marques of Queensbury rules were enforced was Jack Reiss. By now most boxing fans are familiar with Reiss as he has been the referee for many of boxing’s biggest recent battles. Reiss, who is no stranger to handling the heavyweights, had his hands full over the course of the first 11 rounds and he was doing his usual exemplary job. But it was in the 12th round that the ref showed his experience and composure. 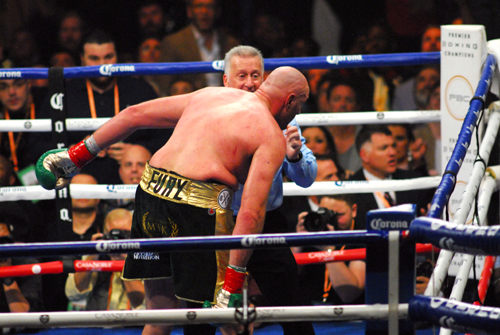 That was when Wilder unleashed a wicked one two combination that put Fury flat on his back. Most in the house including Wilder thought this one was over. Pound4Pound spoke to Reiss on Sunday afternoon and asked him what was going through his mind at that moment and how he handled the situation. 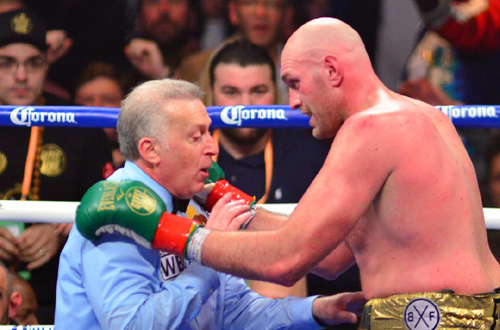 Pound4Pound: Needless to say that was a very crucial point in time of the fight when Fury went down in the 12th. Can you tell me how you process what is going on in only a few seconds and then how you make the decision on whether or not the fight should go on? And let me say that everyone to a man agrees you did make the right decision. Jack Reiss: Thank you! First of all let me say there are a lot of things that go on in the background before something like that. I was taught whenever you can always count a champion out! When you wave it off it’s controversial. We are talking about seven or eight seconds you are saving, it’s not going to make a difference. 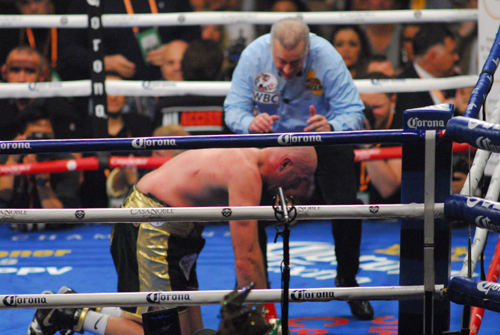 You always count a champion out, he gets KO’d rather than waved off. If he pops up two seconds later everybody is going to be hollering, “What did you stop the fight for?” The champion deserves to get the count. Now, in addition to that, the fight was in the 12th round, he was in the fight or winning the fight, so I do not want controversy, I wanted to make sure I let the two guys settle it between themselves and the best was to count to ten or let him get up and stagger across the ring and show everybody he is out of it and then I could wave it off. If I let him get up and he staggers then I wave it, no controversy there. But in this case he got up he didn’t stagger, in fact he was ready to go. In fact, within ten or fifteen seconds after they started to go back at it Fury was taking over the round! So my goal is to always let the fight go to its natural conclusion if I can, without ever violating safety. That’s all I was trying to do. When he went down I turned and picked up the count. Then I got over to him and scooted right over his face so he could hear me and he could see clearly my hands. He was cringing with his eyes like he was either in pain or unconscious; I don’t know what it was but obviously he was in pain. As soon as I counted 5 he heard me and opened his eyes, kind of like when you wake up a drunk, you know how there eyes get wide open. Well, he opened his eyes wide open and he took a breath and rolled over. When he got up on his feet he was talking to me. He said “I am alright ref,” and he even put his hands on my shoulders. I had to push his hands off my shoulders and I made him walk, and the rest is history. You know Bill, I don’t want to stop a fight in the twelfth round of a competitive fight of a heavyweight world championship. I will count ‘em out, or I will let them get knocked out or just let them finish the fight, that is the best way to go. P4P: That’s a lot of information to retain and apply along with the fact that we are all human too. So along with all that do you also have in your mind, “Those were some vicious punches he just took, there is no way this guy can get up?” Or because you are so well trained and experienced could it be these questions do not cross your mind? JR: Yes, that does go through my mind. I did not think he was getting up from this. Fury has unbelievable heart! 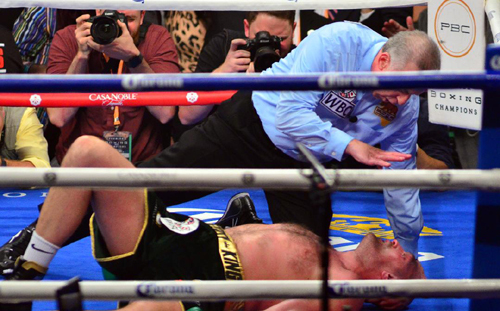 There are two things I learned last night from Tyson Fury; I gained a total amount of respect and admiration for him. 1, he has heart. 2, he can box. He is a 6 ft. 9 inch 256 pound monster that was bobbing and weaving and slipping punches all night. And he did it for twelve full rounds. This is a big guy doing that, not a 130 pounder! P4P: This is a big guy moving like that in the ring. To be there in the ring with him must be shocking to witness. JR: Like I said, it gave me a lot of admiration for him. He really was not the awkward and jerky guy I thought he was from watching him on TV. In the ring he is smooth and fluid, he really impressed me. I was pleasantly surprised. P4P: Because of all your experience I am sure you knew that this was a pretty close fight going into that last round. JR: I felt that it was a close fight, yes. P4P: How was it to be in their working with two men of that size? JR: I have done this before with Wilder against pretty big guys so I already had that experience. I was ready for it. P4P: As far as heavyweight fights go I am sure you will agree that was a darn good fight. JR: That was a great fight! I respect both of these guys, they really gave it their all. You can’t take anything away from them. They both gave it everything they had last night. They didn’t leave anything on the table. They did everything they could to compete and beat the other guy and win. What more could you ask for? Was it a great fight? Hell yeah. It had unbelievable and exciting moments. In the end I have no problem with it ending in a draw. This entry was posted on Monday, December 3rd, 2018 at 7:08 am	and is filed under Boxing. You can follow any responses to this entry through the RSS 2.0 feed. Both comments and pings are currently closed.